Thanksgiving is one of the few days during the year where we toss all notions of diet and healthiness out the window to overindulge in delicious dishes like stuffing, mashed potatoes and endless slices of pumpkin pie. But you don’t have to break out the expandable waist pants on Thanksgiving by swapping out a few calorie-laden dishes with healthier ones and changing a few Thanksgiving day habits. 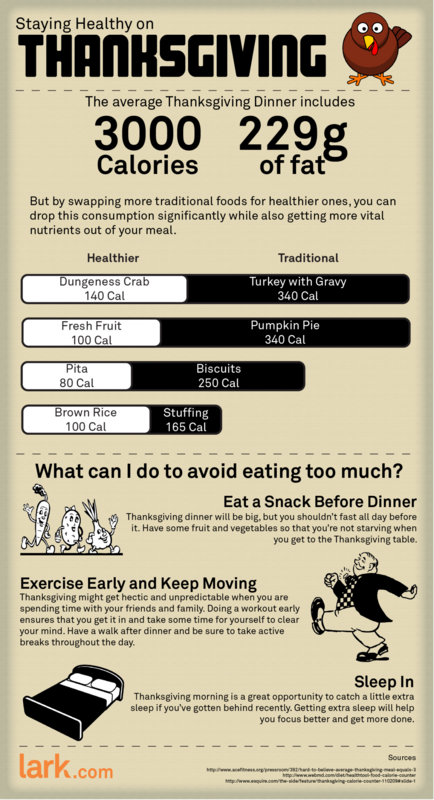 Check out the infographic below for how you can make this Thanksgiving a healthier one. Skip turkey with gravy and opt for dungeness crab. Trade pumpkin pie for fresh fruit. Eat a pita instead of biscuits. Cook up some brown rice instead of stuffing. Exercise early and keep moving throughout the day. Don’t become a couch-potato. Take the opportunity to catch some extra zzz’s. Having enough sleep helps curb carb cravings.